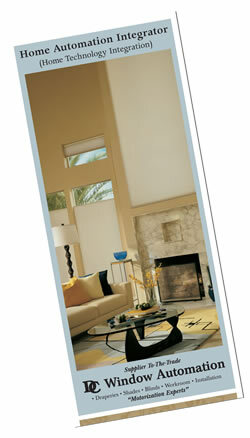 Custom motorized window treatments are a necessary part of any complete Home Automation Program System. Now you’ll be prepared to offer your clients this essential and important aspect of motorization – without having to become a window covering expert. We offer a professional turn-key service that can work under your company’s umbrella. You determine the need and application, and we’ll handle the details from there. This includes the window treatment design, fabrication, motorization and electrical requirements – all coordinated with you to work with your automation control systems.